Big thanks to everyone who is helping make this happen: Chiefs, teachers, Lynn & Aubrey from WAG and, of course, the hope growers themselves. We've been visiting some of the schools taking part in our Tuesday Trust growing project with the remarkable Lynn Clifford from WAG. Progress varies from location to location. It was so heartening to see how well things are going and growing at Namachete, where a great teacher group are really leading the way. There's a rich crop of ground nuts, meaning food for the pupils. We can only do so much to provide inputs and training, but day-to-day, improvements to quality of life and education can only come from strong leadership from the head teachers and local chiefs - so we are so grateful for everyone's efforts here. Most of all, it's so inspiring to see the kids taking to it and blossoming. Hope is the thing with feathers. Despite the hunger and poverty, our schools programme with our friends and colleagues in WAG is starting to stick. Education is improving and with this we are having a positive impact on the future of these young children's lives. The schools receive books, pens, foot balls. WAG and TT have just helped to build the only health centre in this district and two new class rooms in two different schools. We have painting classes, they grow veg and sell it. The kids plant trees, they know all the wildlife that live here and know the names of the animals. This a huge change. No other NGO nor the government are working in these areas. These villages and schools are far from town, 35 kms to the nearest hospital and the only form of transport is bikes. These people and their children are some of the poorest in Malawi. And yet: hope can shine through. The first pupil from one of the schools we support has just finished his 1st year in college, studying Conservation Science. Every journey starts with a single step. Thanks for your support. 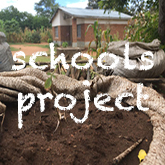 We're delighted to be able to partner with WAG in Malawi on our Schools Growing Project. Lynn and her team, especially Aubrey, maintain a presence all year around and supply the materials and teaching to make it possible. Huge thanks to them. The schools are all based around WAG's Thuma Forest Reserve, which is west of Lake Malawi (see maps below). 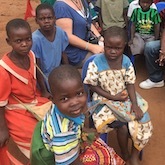 TT dynamo and board director, Anne-Louise Kelly landed in Malawi last week to catch up on our projects there. First port of call was Ndi Moyo Palliative Care Clinic in Salima to meet our great friends, Lucy & Tony Finch and see how the Patient Support Group garden is going. We set up and support this growing project to help the clinic's patients feed themselves, as well as learning growing skills to share in their villages. Of course there's a mindful therapeutic value to the actual activity too. Great news is the Group has done a wonderful job with Peter, its chairman. All green in this image is edible. Soya in the foreground, as well as ground nuts, soya and OFSP. A lovely welcome back… and a positive story in a land where they're all too few. Thanks to everyone who has helped us support them. Big thanks to everyone who supported us so generously with our School Dinner fundraiser last week - all our friends, sponsors and guests. It was lovely to meet everyone who made it to Hartley's and thank you all for throwing yourselves so wholeheartedly into the "homework". Moreover, it wonderful to have so many people who couldn't come on the night, send us sponsorship anyway - it really is appreciated. We were lucky to have been given a number of fabulous prizes for our raffle here - thank you so much. To Gary Jermyn for his impromptu rattling off of a few verses of The Love Song of J. Alfred Prufrock - top of the class - and for reciting his own thoughtful poem inspired by a visit to Uganda, Reading the Signs. Our sincere thanks also to Deirdre Crookes, Holly & Indi Pratt Kelly for all their help. A particular call-out, of course, to our great friend, Kieran FitzGerald who was MC, for speaking so eloquently and keeping it all moving along (some tables did need more encouragement than others), including delivering the line of the evening: "We're here for the Tuesday Trust on a Wednesday night with Mister Friday." 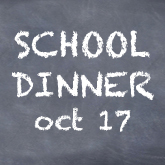 The Tuesday Trust is holding its almost annual fundraising night in Hartley's in Dún Laoghaire on Wednesday, Oct 17 with our School Dinner. We're raising money to support our food growing and self-sustenance initiatives in Malawi, in particular our Schools Growing programme. It teaches children how to grow their own food, supports vegetable growing gardens in their schools, with a competition to add some fun to what is virtually a life and death struggle for many. It's hard to learn when you're starving. So we hope to keep kids in education longer, particularly girls who are more inclined to have their schooling curtailed. Please email us here if you'd like to feed some hungry minds. And have some fun while you're doing it or to get involved in any way. Many thanks. You can pay on the night by cash, cheque or card. Chagunda – Serves 43 villages. 4 GVH, 1 PTA, 1 Head teacher, I headmistress. 320 pupils. Young school. No water. Children to bring a bucket of water from their village for nursery. They are all primary schools, from standard 1 – standard 8 (aged 6 – 17/18 yrs.) Each is government-run, with an average number per class 200. School days are from 7am - 1.15 pm. Unfortunately, like many schools here, these are massively under-resourced, with no books, water sometimes having to be drawn from a distant well and, of course, those huge class numbers are a challenge. But the kids and teachers are enthusiastic - and so we'll give it our best shot. Most of these kids have only one meal a day. Usually in the evening. Schooling becomes very difficult for the chikdren as the hungry season approaches in Jan/Feb. Attendance declines in all schools. The pupils get taught by Aubrey, along with their own teacher - how to plant and grow from seeds, living in harmony with the forest, the animals, and introducing good basic agri practice and food nutritional knowledge to all of the children in the schools. To add a bit of fun and give the children an extra group motivation, there's a competition. At the end of the year, each school weighs outputs and tallies money earned from the sale of any surplus. There's a big trophy for the school winners, with football/netball strips, and balls for the pupils. All money in each school is taken care of by an elected committee made up of parents, teachers, PTA and chiefs. This project is being successful primarily because Lynn is on the ground and she is responsible for the delivery of the program through her extension worker – Aubrey. There are no other NGOs working in the area. However, if it continues to go well, hopefully other organisations will notice how committed the entire community is to this project – and they will come and offer other support. In addition to our new schools, we will continue to work with the original 5 schools also on the border of Thuma. (which began in Jan 2017). This brings the total number of pupils with access to the project to approx. 10,000. Last season's Schools Food Growing Competition in Malawi proved to be a great success with pupils and teachers. The kids got lessons in horticulture, from planting through to harvesting, weighing and creating a sustainable surplus. Plus, vitally, they grew their own food - it's hard to learn when you're starving. We had 5 schools last time; this time we're planning to extend it to 10. 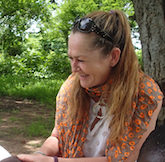 Anne-Louise is in Malawi again now in September overseeing the new project - and buying the key inputs for the pupils. Her haul includes: 4000 copy books, 200 kgs of ground nuts, 40 packets of vegetables, 10 watering cans, 10 bottles of pesticides, 3150 pens, 2,500 chalk sticks and 100 hard books. Tuesday Trust's Anne-Louise Kelly & Lynn Clifford met TA Kalonga and other local Chiefs in Thuma district recently to rubber stamp progress and update them on plans going forward. It proved to be a very successful get-together, with wide-ranging discussions on a number of topics as well as our projects, including education, climate change and food security issues. Various agricultural inputs were handed over, with Aubrey, our agri-extension worker doing the honours. Lynn is a great supporter on the ground for us, in parallel to her work running WAG in Thuma National Park. Thanks to the TA, the Chiefs and everyone who attended and contributed. 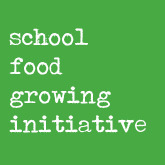 One of the new projects we have developed is a Schools Food Growing Competition. This combines 2 of Tuesday Trust's focuses: food sustenance and education. This initiative introduces a new school feeding program set up between Tuesday Trust and WAG (Wildlife Action Group) and we have teamed up to support 5 school feeding programmes. The schools are in competition to grow the most vegetables/food crops whilst keeping accurate records of weights and sales. It's turned out to be a great success so far. Both programmes - delivered by Aubrey, an agricultural extension worker - are sponsored by WAG with inputs supplied by TT. All the schools, Namachete, Kavinguti, Msindikiza, Chagunda and Mkombe are all located on the border of Thuma Elephant Reserve, which is under the management of WAG, run by an amazing Irish woman, Lynn Clifford, who also is a manager for Tuesday Trust. School holidays come at the end of July until September, but the children will still continue to tend the crops throughout the summer. We organised it as a competition to help make it fun. The prizes are simple: Footballs, netballs, sports kit and classroom resources like chalk, copy books, pens and tee shirts for the teachers. The kids are being taught vital skills in horticultural and self-sufficiency, as well as feeding themselves. You can't learn well on an empty stomach. It's wonderful to see progress on this new government-run health clinic on borders of Thuma which TT has given some small support towards. In partnership with WAG and some other NGOs, we contributed to building materials. In practical terms, this new location will mean people don't need to walk up to 35 km to get to health centre, but around a max of 5km. Of course, by our lucky Western standards, that would still be an extraordinary trek on foot while ill, but for rural Malawi it's a hugely welcome improvement. Thanks to everyone for their support, we're just the conduit. We'd like to offer a really sincere thanks to Camara for generously supplying us with a computer for our field staff in Malawi. In particular, Breon Timmons and John Fitzsimons who made it happen for us. It has landed in Malawi and will be put to good use by our local field manager in running 2 sustainable agricultural projects in villages on the outskirts of Thuma National Forest Reserve. Like any other project, success depends on accurate reporting and recording-keeping, and clear communications, and this will be invaluable for us. So thanks again. Camara uses technology to deliver 21st century skills, and as such improve education in disadvantaged communities around the world. Huge heartfelt thanks to everyone for so generously supporting our Almost Biennial Dinner in Salt Café on Nov 18th: those who made it and those who missed a great night. And we hope you don't mind if we share a little news with you now and again on progress. Love and thanks to you all. Please join us for dinner on Nov 27 and help tickle some feathers. We’re raising funds for two new initiatives: one is a village food project with 165 families in Mphinzi and the other, a demonstration garden at a palliative care centre in Salima. So please join us for dinner at Salt in Monkstown on Nov 27 at 7pm to discover more about what we’re doing, enjoy some chat, a few diversions and perhaps even a raffle or two. Nothing serious. Except the cause. Maybe we’ll get some of that stuff with feathers going. Drinks followed by dinner with wine is €100. To book a place, please email orlaith@tuesdaytrust.ie. Thanks. Thanks again if you've got this far. 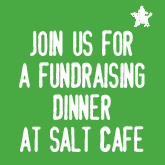 Please join us at our Almost Biennial Fundraising Dinner in Salt Café, Monkstown Crescent on Wednesday, Nov. 18th at 7pm. 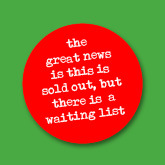 THE GREAT NEW IS THIS IS SOLD OUT, BUT WE ARE KEEPING A WAITING LIST IF YOU'RE INTERESTED, THANKS. JUST USE THE EMAIL BELOW. Support ongoing vital food sustenance and education projects in Malawi, helping some of the poorest, most vulnerable women anywhere to help themselves. Your kind assistance for something as little as a watering can will change a life. In fact, it can save one. Tickets €100 - drinks reception, dinner with wine, short speeches & entertaining diversions. Please email Ann or Tom at: fundraising@tuesdaytrust.ie for details and tickets. 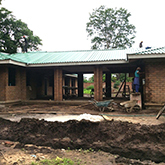 We're delighted to see the new building at Ndi Moyo coming along so well. It's hoped that it will be ready in 2 months time. Our garden project around it is flourishing too. One of the key tenets of our approach to helping in Malawi is to encourage and nurture the women involved in projects to become self-sustaining. This takes time, of course, as we try to introduce better horticultural practices to be more efficient and so facilitate everyone getting more out of their efforts. Now two years in, perhaps it's starting to come together. Better skills, better crop choice, support with seeds, fertilisers and tools has instilled a real sense of pride and ownership among the group as well as providing food for dozens of families here. As ever the climate is something of random influencer, with droughts being followed by flooding. Extreme to extreme which can undo a season's hard work all too quickly. These are the fine margins at play in Mphizi and across Malawi: we just need to keep working to build that buffer that will allow these desperately poor, often quite ill, but endlessly positive women ride out these weather-triggered challenges. We can only do it because of all the generous help from our friends and supporters. Thanks. Great progress from the women at Mphizi garden after just a few weeks. a remote mountain village called Mphinzi. village we are working in. In her “spare” time – she takes care of business for the TT. considering he is living at a palliative care clinic in a dusty town in Malawi. They are all poor and hungry. So Brendan and Lynn put all they had into putting this right. are looking at feeding 36 families from this years crops. The gardens at Ndi Moyo (under the beady eye of Brendan) are doing well. these photos that best illustrate the last few months. In Malawi as in much of sub-Saharan Africa, the weather plays a constant game of Russian Roulette with agriculture and horticulture. Dry seasons sometimes linger and dessicate everything; rains can arrive with such ferocity, the crops get washed out. Like the secret of comedy, timing is everything, but it's no joke when lives are at stake as they often are in such a finely balanced cycle. There's a feeling among the women on some of our projects that global warming or climate change has brought more randomness and changeability than before, but really, who knows? Irish weather changes at a whim: two years ago a couple of bitter, snowy winters. This year, a summer that lasted into October. However we don't have so much on the line. Unfortunately, it's all too often that it's the Hungry Season that dominates. By introducing better methods and more robust strains of crops, at the Tuesday Trust, we're trying to take the variability out of it, bring more certainty and control. Stop families waiting hungry. It's where your help is vital. Great speches given by two of the Headmen telling ladies that what they have received should not be misused and this is their chance... everyone around here would love to have the pumps and the chance that they have been given.. so they should work hard to make this project work for them. So a great way to kick it off and a real community spirit from everyone. Thanks to Lynn as ever for boots on the ground, camera in hand and scarf used as official opening ribbon..
We're delighted that work is continuing apace at our Demonstration Garden at Ndi Moyo. Planting has started on this project and we're excited about the whole development of new facilities at this vital palliative care clinic. See the plans below. Brendan Cairney has generously just gone out to Salima for another 2 months to work on the Patient Support Garden Project. It's an amazing commitment by Brendan and his expertise will reap extraordinary rewards among the dozens of families involved. This is a life-changing, saving saving contribution. We're looking forward to getting news back from him and maybe even a snap or two. A big thank you to everyone who supported us recently at Salt on Nov 27th. To all our family and friends and hangers-on and colleagues and sponsors and chancers, well, you all know who you are: thank you so much for your generosity and kindness. To Simon, Liam and the team from Avoca, Clodagh, Sam O'Sullivan for the sounds, Eimear, Emily and Anna – a sincere thank you for helping to pull it off. To Kieran Fitzgerald – for being your usual loquacious, funny, wonderful self. Thank you. To the Kili walkers who kickstarted the project in 2008 with their donation making an incredible difference to many lives. To the many anonymous donors who supported TT along the way, ducking any praise. To all those who contributed themselves, who came to Malawi and shared their time and expertise, who listened, reached out and gave hope. To our community of accountants, auditors and very useful, naggy friends – who keep us accountable. Thank you all on behalf of the women we work with in Malawi from Anne-Louise, Ann, Orlaith Andrina and Tom. Click here for Anne-Louise's Thank You speech from the night. Here's a short slideshow telling the story of what we're hoping to do next. It's only 2 minutes long, have a quick look. Thanks. Music thanks: "One Fine Day" by David Byrne & Brian Eno off "Everything That Happens Will Happen Today"
We work with our women’s groups for a limited period of time so as to discourage dependency and to be sure that we reach as many families as we can. We have decided that we will work in Mphizi Village next. This village will replace our 5 current groups. The village headman has kindly donated 20 hectares to The Tuesday Trust on the edge of a river called The Linthipe River that feeds into Lake Malawi. We want to start our work here as soon as possible. We plan to grow vegetables on ½ hectare to begin with and to provide sensitization training on new crops that are more drought resistant. We would like to install a treadle pump on site to ensure a good start. That will cost approximately €87. We also want to work with the local school here in the hopes that the school will have at least one meal from the produce everyday for the children. Ideally we would like to start in November/December. We want to plant OFSP, cassava, chilies, lemon trees, mangos, guava and medicinal plants. These are all strains of crops that are drought resistant. There will be massive hunger this season everywhere. Hunger is evident in all of the villages we work in. The market stalls are empty. We want to do what we can to help. One in seven people in the world suffer from hunger, while a further one in three people are undernourished. The fight against global hunger and undernutrition is a key component of Ireland’s foreign policy and our international aid programme. While we provide emergency assistance in response to hunger and nutrition crises, our main focus is on the prevention of such crises. "Most people associate hunger in developing countries with the images of extreme starvation and famine often seen on TV or online in the aftermath of disaster or conflict. Far less attention is given to the devastating effects of long-term chronic hunger and malnutrition suffered by 870 million of the world’s poorest people, most of who live in sub-Saharan Africa and parts of Asia. Although the world produces enough food to feed everyone, it is estimated that one in seven people do not get enough food to live a healthy life. Poor people are most at risk of hunger. It can impact on all areas of their lives, trapping them in a poverty spiral. People who are undernourished are less resistant to diseases like malaria and tuberculosis, making treatment less effective. In the case of children, we know it can affect their ability to learn and concentrate in school. On a wider scale, environmental damage and climate change continues to degrade the land of people already at risk, destroying their crops." This is a good fight and one worth fighting at every level. 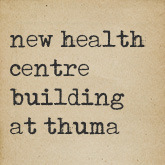 We have been lucky enough to work with Ndi Moyo Palliative Care Centre in Salima since we started the Tuesday Trust. Lucy & Tony Finch who set it up and run it have been an enormous support to us, helping us to monitor our projects and to administer funding. They also allow us office space within their busy clinic - which really is a haven of comfort and hope. In January the Tuesday Trust provided support in the form of a volunteer gardener to Ndi Moyo. Now we hope to join forces with Ndi Moyo to develop a demonstration garden intercropping OFSP with medicinal plants, a couple of mango trees and chillies. Lucy already has a fabulous medicinal garden which she runs as part of their incredible palliative care programme. So this fresh initiative will be a perfect fit. Less hunger, better health and more wealth... that's the compelling headline that starts this piece on OFSP or "Orange-Fleshed Sweet Potato". It's a crop we at the Tuesday Trust are promoting with our members: why? Well it's no ordinary sweet potato, it's new vitamin A-rich and drought-resistant orange-fleshed sweet potato, featuring varieties that have significant levels of vitamin A. Sweet potato varieties with dark orange flesh have more beta carotene than those with light-colored flesh, and their increased cultivation is being encouraged in Malawi and Africa generally, where vitamin A deficiency is a serious health problem. Interestingly, Malawians call sweet potato "potato". In Chichewa, sweet potato is "mbatata". Meanwhile the potato itself, they call "Irish" potato. We are lucky to have a resource in Putri Ernawati Abidin, (known mostly as just Erna), the project manager for The International Potato Center (CIP), who is charged with training of the trainers, agriculturists and lead farmers. Read more about the project here and the valuable advantages of OFSP as a crop for Malawian farmers. 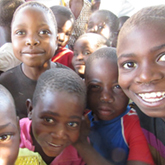 This ’Rooting Out Hunger in Malawi’ project is funded by Irish Aid. Despite ferocious weather patterns several of our gardens experienced a particularly good harvest in 2013. A family of 5 consumes approximately 370kg of maize per year. A one hectare field of maize with good yield should gives approximately 12500kg of maize. If each person in a family eats approximately 1kg of maize per day this means many of our members grew 10 months of maize. This is excellent and has provided food security for 10 months to each family (on average, a member of one of our food groups supports 10 others). Seeing how climate change had such a big impact on our members last year we looked into newer more drought resistant nutritious crops. After careful research we decided that we would work with our groups to grow some sweet potatoes. We are also supporting some rice growing in the wetlands and some cassava. Your support can help us build on 2013 and encourage self-sustenance. We need to get these families to a tipping point where they can seed next season themselves. Thanks. From the time Tuesday Trust rolled out its activities in the villages of Phaka, Mchoka, Magumbwa, Mtika, Chimoga and Chipoka many lives of women and their families have been transformed. Five groups comprising ten women benefited from farm inputs provided by Tuesday Trust. These inputs include seeds, fertilizers, chemicals and garden tools such as watering cans. In total twenty (20) gardens were planted with crops like groundnuts, cotton, maize, vegetables and c/peas. Currently these groups have OFSP (orange fleshed sweet potato) gardens with Nursery which they will plant immediately after first rains. So far 9 ha of land were planted with maize, 4 ha with ground nuts, 5 ha with cotton, 1.5 ha with vegetables, 5 ha were planted with c/peas and 0.5 ha is currently planted with OFSP nursery. A part from the farm inputs that were provided, these women benefited a lot from the various training sessions that were held. These trainings includes gross margin analysis, post harvest loss management, budding and grafting, crops dynamics /organisation, vegetable production, food processing and utilization and OFSP seed multiplication. Tuesday Trust has successfully provided all the necessary inputs to targeted vulnerable women with an aim of uplifting their lives. The degree of vulnerability of these women has been reduced. They have enough food for their families. With the money realised from the sale of cash crops like cotton and ground nuts, they are able to pay school fees for their kids. Now these groups are eagerly waiting for nutritious food products of the OFSP. However some women have had poor harvest owing to poor organisational skills of their groups and poor soils and scarcity of water among other factors. 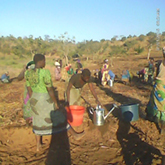 Climate change affected our village groups badly during 2012 and the rains were very late affecting the whole year's output. 12.5 hectares were planted with maize, soya, groundnuts and cotton. Drought mitigation training was delivered to 4 gardens. In November 2012, we took on a new part time employee, Mr Pindani as our Field Manager. He is an experienced agricultural extension worker and we are very optimistic about the contribution he is making already, and not just in horticulture and growing, but areas like conflict resolution. 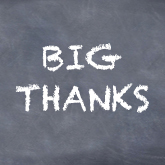 Many thanks for everyone's support in 2012: your help makes a huge contribution to our small efforts. A small group of Tuesday Trust volunteers visited Malawi recently to assess progress at the various food sustenance project sites and ended up getting stuck into some hard digging. They were lending a hand to a community organisation, The Women's Voice (Tiyendi Pamodzi) which is being supported by Tuesday. Land was being prepared for a Micro-Irrigation Project at Mchoka Resource Centre which it's hoped will become a showcase for the benefits of targeted, low-wastage irrigation. All the work is done manually by the women using hoes to slash, dig, turn and level the hard, dry soil. The total site of some 1.5h has been kindly donated by the local chiefs. A 40m x 15m plot is set aside for the micro-irrigation system which is generously being installed by a Malawian NGO, Total LandCare (www.totallandcare.org). Two boreholes have been sunk at the Resource Centre to supply a tank which trickle feeds the plants right at their roots. The fencing is to keep goats out. The project is being supervised by Tony Finch and managed on the ground by horticulturalist, Kennie Mboma, our Field Manager. The remainder of the site will be used for other community-based food growing including fruit trees and even bee-keeping. Meanwhile the Tuesday Trust is also supporting the provision of teachers at the Resource Centre in partnership with Tiyendi Pamodzi to provide adult education for the local women. The Tuesday Trust supports the work of Ndi Moyo Palliative Care Centre in Malawi. HIV/AIDs is devastating vulnerable communities at an alarming rate in Malawi, with entire swathes of communities being wiped out. Despite its preponderance, levels of stigmatization are high and there are inadequate care and social support services for people living with the virus. Lucy Finch’s Ndi Moyo Centre provides palliative care for some of these people. It works to alleviate the suffering of those who are terminally ill, bringing care and dignity to those who need it most. Ndi Moyo is a day care centre that is holistic and meets the needs of individual patients and families. As well as the clinic itself, she has established a wonderful garden full of healing plants. Some help with the symptoms of the virus, others with side effects of the viral treatments. Lucy Finch, who set up Ndi Moyo (which means The Place Giving Life), is an exceptional person. Malawian by birth and a nurse by profession, after living outside the country for 38 years she returned in 2002 to offer the skills she had gained with Hospice Uganda to her home country. She herself had had close relatives who had died of AIDS and knew at first hand, the pain and lack of dignity they had gone through. And so she decided to establish Ndi Moyo and its amazing garden. Frangipani: they use the milk from this plant for Herpes Zoster (shingles) which is very common in HIV/ AIDS. This is our last season working with the Salima Women’s Network, SAWEG. We were delighted to partner them for a few years and over 1000 people have enjoyed food security annually as a result, with dozens of women receiving training and workshops on better planting techniques and crop management. We wish women of SAWEG the very best with all their initiatives going forward: they are an inspirational bunch. And, who knows, we make well partner again in the future. The Network envisions a life where women and girls are free from gender-based violence and is addressing education for women and girls, the rights of women & food security and, of course, HIV and AIDS.